Dress your little girl like a princess. Beauty isn't just in the eye of the beholder when it comes to infant pageant dresses. While your baby will look beautiful in anything, you can find the perfect dress to make her debut into the pageant world a memory that will last forever! Think your infant is too young for beauty pageants? Think again! There are many parents who make the rounds of the pageant circuit before their babies can even walk. Think about all the babies you've seen in TV commercials, magazines ads, billboards, and other advertising and entertainment venues. Those babies didn't just magically appear in those ads and presentations. They have parents just like you who spent time searching for the best modeling outlets and pageants for their children. Prizes can be as little as a certificate of participation or as much as a modeling contract and even big bucks! Preparation is important. Even if your baby is just an infant, you'll want to do a few practice runs before you parade her in front of the judges. This is really more for you than her, however. Decide how you want to do her hair. Try on her shoes and socks ahead of time to check for discomfort. Try on her infant pageant dresses as well to make sure they fit comfortably. Get all the details beforehand. Find out exactly what time you and your daughter need to be at the pageant. Try to get her to take a nap before the pageant, so that she is well-rested and more willing to put up with all the fuss of getting ready. Build a portfolio. Start taking a few pictures of your baby with your own digital camera. If the pictures are good, then add them to the portfolio. Consider using a professional photographer, however, to build a really well-developed portfolio. Some contests are online, and all you'll need to do is send photos along with the contest application. 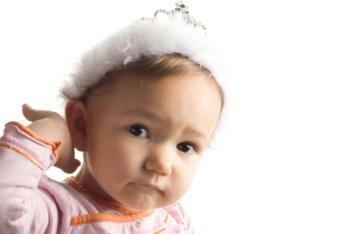 Now that you're ready to enter your baby into some pageants, you need to know where to look. Watch your newspaper. Local pageants typically do a lot of advertising, so pay attention to ads in your local paper. There may be pageants listed in the classifieds as well. Check out baby magazines. Many baby magazines feature baby contests that could lead to modeling careers. Ask children's photographers. Many photographers are familiar with reputable baby pageants, and they may be able to work with you and your baby to develop a portfolio as well. Choosing infant pageant dresses may not be as simple as it sounds. Depending upon the style and design of the dresses you purchase, you can end up spending a small fortune. There are some ways to save money, however. Check out consignment stores. Because pageant dresses are often worn only once or twice, you can often find dresses for a fraction of the original cost in excellent condition. Check online auctions. eBay is a great place to look for pageant dresses as well. Consider dress swapping. Once you enter your baby in the pageant circuit, you may find some parents who will swap dresses with you. Commission a dress. Find a seamstress that will sew the dress for you. Pick up material that is on sale, choose a pattern, and sit back and wait on that beautiful, made-to-order dress.